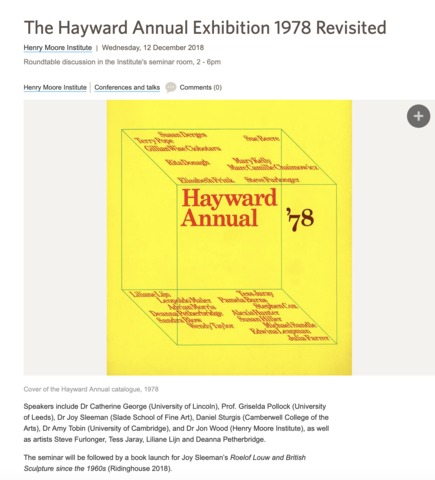 A paper on the contemporary reception of the artist Adrian Morris whose work was included in the Hayward Annual 1978. Adrian Morris's (1929-2004) paintings have recently been championed in the UK by various British artists including: Merlin James and Carol Rhodes who exhibited his work at 42 Carlton Place Gallery in Glasgow (2015); Matthew Richardson who exhibited his work alongside that of Rhodes at his project space London (2016) in Balfron Tower; and Matthew Pang who arranged for an exhibition of Morris's work at Le Bourgeois (2018) in London. This invitation came after Sturgis convened a painting research seminar on the subject at Camberwell College of Arts (25.10.18) and invited Merlin James, Matthew Pang and Anna Susanna Woof to present on the subject.